Lucrecia Martel is the elusive poet of Latin-American cinema, missing believed lost, the Mary Celeste in human form. She made La Cienaga and The Holy Girl; split the Cannes audience in two with her brilliant, maddening The Headless Woman. And then, all at once, Martel seemed to vanish. There were rumours that she had been unwell, or that she spent years kick-starting a stalled science-fiction picture, or that she’d embarked on a long boat trip right up the Amazon. I think I like the third option the best. It makes her sound like Mr Kurtz. 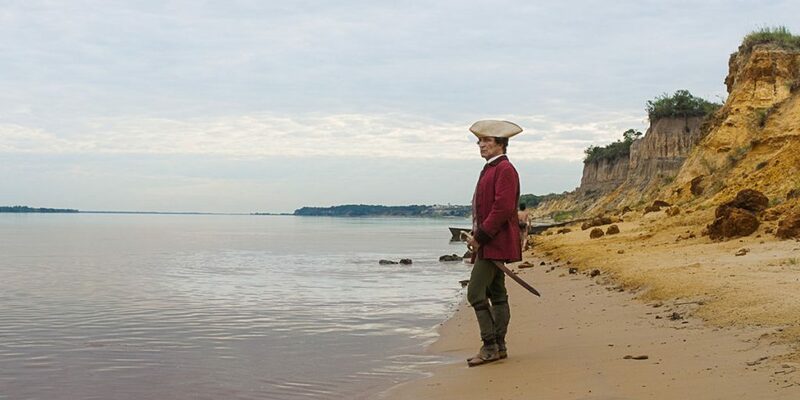 Now Martel is back, after a nine-year absence, with the astonishing Zama, adapted from a novel by Antonio Di Benedetto, about an 18th-century Spanish colony perched on the Asuncion coast. Her film is haunted, haunting and admittedly prone to the occasional longueur insofar as it runs to its own peculiar rhythm; maybe even its own primal logic. It arrives in Venice as if blown in from another world. Audaciously, Martel refuses to provide date or a location, let alone any handy background information. She’d rather set us down at the water’s edge and leave us to find our own way from there, mixed in amid the other colonialists and settlers who cling to this desolate lip of the land, sweating buckets beneath their periwigs. Soon enough we encounter Don Diego de Zama (Daniel Gimenez Cacho). He serves as the crown’s magistrate, a Spanish functionary, but his pleas for a transfer are being constantly rebuffed. He’s pining for home, for cold weather; lying in the grass to ogle women bathing and dreaming of “Russian princesses wrapped up in their furs”. Beyond the settlement there is the jungle, the wilds. This is reputed to contain masked warriors, painted ghouls and a terrifying brigand named Vicuna, who may already be dead, assuming he ever existed at all. But these, perhaps, are mere distractions. Basically Zama is a film about a man who waits, unhappily, for his own release. I hope Martel won’t have to wait a further nine years before she makes her next film. She’s too good a director to be sat on the sidelines for long and Zama may just be her left-field masterpiece; a picture that’s antic, sensual and strange, with a top-note of menace and a malarial air. The heat is intense; the settlers go berserk. Nobody here is quite stable; nothing can be trusted. When Don Diego finally encounters the grinning Vicuna in a meadow at midnight, one half-wonders if he’s suffering from some sick hallucination. But then this fabulous film is full of so many odd scenes – and some of these scenes are very funny as well. One day, for instance, Don Diego is called to meet the governor inside his fancy office. The governor explains that Zama’s latest appeal for a transfer has once again been turned down and that a despised fellow functionary is now being released in his stead. At the peak of Don Diego’s misery - just when things can’t get any worse - a dirty white llama clip-clops into the room and takes up a position at our hero’s back. It’s a devastating moment; insult added to injury. No humiliation, one feels, is truly complete without a dirty white llama breathing down your neck.